It’s really amazing that if you use Azure AD, you have the option to use more than 3000 3rd party apps. As the Azure AD Team says, these apps are the most popular and fastest growing capabilities in Azure AD. But wait, there is more: it seems that they keep adding applications every single day or so, and you still have the option to submit your application to be included in the list. If you want to suggest a new SaaS app, please submit your request using the Azure AD Application Request forum. 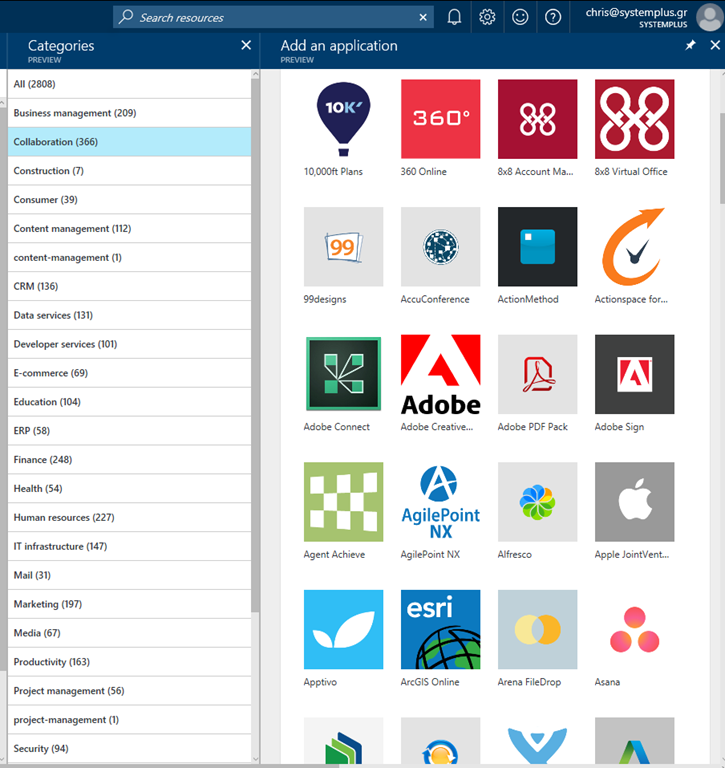 So today we have 22 new 3rd party apps to the Azure AD app gallery. I’ve already copied the list from the Azure AD blog original article, you can still go there to read it. FirmPlay: Employee Advocacy for Recruiting manages your employee Advocacy program with powerful software that lets you curate, collect, create, and share employee generated content with prospective talent. FirmPlay app allows you to easily collect employee insights and turn them into engaging, shareable recruiting content – the kind that resonates with top talent. Patheer Coach provides the tools for employees to continually grow and develop skills, it also empowers leaders to drive performance. The Patheer Coach app allows leaders to capture and analyze their talent landscape, such as identifying high-performing employees, forecasting talent and skill capability gaps to build a strong talent pipeline. Pingboard is the place for everything you need to know about the people you work with. You can quickly build your org chart and share it with your team. Everyone will always know who’s who and who does what. Pingboard is the employee directory, org chart and out of office calendar. PlanMyLeave is an HRIS and online leave management system designed to scale easily from small to medium businesses to large enterprises. PlanMyLeave helps you customize leave types and set up complex leave policies for any country. Cavintek’s Cflow is a cloud-based business process management app that helps streamline and automate business process in SMBs. Cflow moves organization from emails and spreadsheets to using business apps and secures all communication. Contract Rebates by Xen Computers Limited manages contractual pricing agreements between indirect customers and wholesalers, providing validataion and payment of rebates together with financial control and reporting capabilities. Lecorpio Intellectual Property Management provides a secure, web-based portal that centrally manages the entire IP lifecycle – from the submission of disclosures all the way through to the payment of annuities, and ongoing opposition filings, enforcement actions, arbitration, litigation, contracts, license agreements and more. Lecorpio is trusted by the world’s most innovative companies. Fuze offers unified communication service that enables efficient collaboration at work. Fuze combines voice, video, messaging, and content sharing in a single app with great user experience. MaxxPoint brings together your unified communication apps from West UC with a secure and easy-to-use interface. MaxxPoint app gives you the visibility across your enterprise and the tools to manage your UC services. Teamwork Projects is a collaborative project management app designed to streamline processes and connect your team. The Teamwork Projects app keeps all your team’s tasks in one place, so your team can collaborate in real time for great results. Works Mobile Chat Service offers business messenger service for users to talk with their contact list freely. Users can easily send photos and videos while talking and can also share contact and location information. Works Mobile is the only business chat to connect with LINE. LINE Works also contacts customers and business partners for easy communication. Azure DockIt is a SaaS solution that automatically generates technical documentation of your Azure environment. Azure DockIt can generate a complete documentation of your Microsoft Azure Subscrtipion in less than 5 minutes. Evernote allows you to capture information in any environment using whatever device or platform you find most convenient, and makes this information accessible and searchable at any time from any devices. Evernote helps users collaborate in a single workspace. Inkling offers a mobile platform that brings policies and procedures to life for deskless worker. The Inkling collaborative authoring tools let users select content types, drag and drop widgets, automate import of old files, and allow multiple authors edit the content simultaneously. GitHub is a development platform inspired by the way developers work. GitHub hosts code, manages projects, and builds software alongside millions of developers. GitHub brings teams together to work through problems, move ideas forward, and learn from each other along the way. ServiceChannel provides facilities and contractor management platform that enables complete service automation and repair and maintenance management at all locations. ServiceChannel is in the process of transforming the Facilities Management industry and assisting companies to be better in running their operations. Land Gorilla Client app provides the construction loan software and lending solutions that streamline post-closing construction administration services, so customers can easily scale and control their pipeline as they increase loan volume. Construction lenders trust Land Gorilla. Cerner Central is a web portal for client IT administrators to manage identity federation, access management, and auditing capabilities for Cerner’s cloud platforms: Healthe Intent and Millennium. Cerner Central is the hub that securely connects your enterprise to the Cerner Cloud for app access, authentication token management, audit reports, device access, user accounts and more. your health and happiness with 3 to 10-minute video lessons taught by expert teachers. Adobe Creative Cloud gives you everything that you need to turn your brightest ideas into your best work across your desktop and mobile devices and share it with the world. Creative Cloud provides the essential tools like Photoshop to innovative new tools like Adobe DX. You also get build-in templates to jump-start your designs and step-by-step tutorials to help you get up to speed quickly and sharpen your skills. It is your entire creative world, all in one place. P2ware PPM solution combines leading project portfolio management techniques with 7*24 cloud availability. P2ware Project Manager is a project manage app that embraces all aspects of real world project management from planning to execution. delivers policy-based, secure access to applications and assets without the hassle or security risks of a VPN. The Zscaler approach is more secure than VPN because it reduces the potential attack surface and doesn’t require hardware infrastructure.